NEW YORK, New York, July 30, 2013 (ENS) – In a simultaneous launch on three continents – North America, Europe and Asia – BMW Monday revealed its first all-electric series production vehicle, the i3. The three cities selected for the launch – New York, London and Beijing – indicate where the German automaker believes the best markets for electric cars are in the near future. The three events were simulcast, allowing viewers to experience them in real-time around the world. BMW chief executive Dr. Norbert Reithofer, Peter Schwarzenbauer, Member of the Board of Management, and Global Head of BMW Group Design Adrian van Hooydonk presented the car. Mayor Michael Bloomberg attended the launch event in New York. Members of the BMW executive team were on hand to discuss the future of mobility and showcase the benefits of the first purpose-built plug-in electric production vehicle to be made primarily from carbon fiber. “In 2025, 8 billion people will live on the planet; 4.5 billion will live in cities. There will be 1.8 billion cars on the roads. In order to address the personal mobility needs of people living within the world’s most densely populated urban city centers, BMW created BMW i – the sustainable new sub-brand whose mission is to develop visionary vehicles and mobility services,” Reithofer said. The i3 is the result of what the company calls “an integrated development approach aimed at cutting fuel consumption and emissions in urban traffic.” The driver of the zero-emissions i3 can choose to gear all car’s systems towards maximum energy efficiency. The model is constructed with BMW LifeDrive, the first architecture to be custom-built for electric cars. The vehicle concept and drive system were developed entirely in-house by the BMW Group. With an eye out for sustainability and resource conservation, the BMW Group put together an innovative passenger cell made of plastic reinforced with carbon fiber. BMW says carbon fiber reinforced plastic is equally as strong as steel and 50 percent lighter; carbon fiber is 30 percent lighter than aluminum. 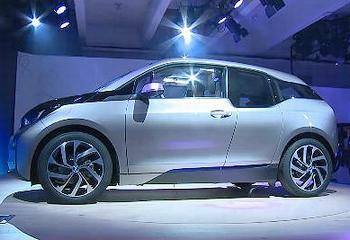 The resulting BMW i3 is an electric car that weighs just 2,700 lbs, according to preliminary U.S. figures. The 125 kW/170 hp electric motor gives the i3 a range of between 130 and 160 kilometers (80 to 100 miles). The range can be increased by up to 12 percent in ECO PRO mode and by the same amount again in ECO PRO+ mode. It can recharge in three hours with the use of a 220V Level 2, 32-amp J1772 charger. The SAE DC Combo Fast Charging, which charges the BMW i3 up to 80 percent in 20 minutes, and 100 percent in 30 minutes, is available as an option. In order to reduce range anxiety, a rear-mounted 650cc, 34 hp, two-cylinder, gasoline-powered Range Extender generator is available, which roughly doubles the vehicle’s range. The LifeDrive architecture concept was purpose-built just for the BMW i3. It consists of two separate units – the Life Module, and the Drive Module. The Life Module is the passenger cabin. It is the first mass produced carbon fiber reinforced plastic passenger cell in the automotive industry, and is a big factor in the car’s efficiency. It is light enough to offset the additional weight of the high-voltage battery, resulting in greater safety and a sense of spaciousness in the cabin. The lower Drive module is of 100 percent aluminum construction. It houses the powerful high-voltage battery, the suspension system, structural and crash components, and the electric drive train. All drive components are housed in the Drive module, so no tunnel runs through the middle of the car, leaving more room for passengers and lowering the car’s center of gravity for greater agility. The high-voltage battery is cooled with a system aimed at keeping it at the ideal operating temperature to boost its performance and lengthen its life. If the BMW i3 buyer has a private parking space at home, BMW will offer a home charging station and send a representative to install it. The BMW i Remote app links to a car and can monitor its battery level, charging status and other charging-related functions, such as heating and air conditioning. The app can also give the car’s location, lock or unlock the doors, honk the horn, or flash the lights. The BMW i3 is the first product of the new BMW i sub-brand. The public launch of the new i3 will take place at the International Motor Show in Frankfurt/Main from September 12th through the 22nd. Drivers in Germany will be able to buy the BMW i3 in November 2013. It will go on sale in the U.S. market in the second quarter of 2014.